Graphic Ink Systems is an independently owned company with over 100 years of combined experience. 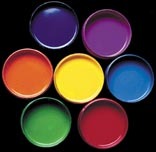 We are a full-service printing ink manufacturer located in Bristol, Wisconsin. Graphic Ink Systems has had the privilege of servicing the printing industry with our unique line of products that meet and exceed industry standards. We insist on building strong relationships with our customers, and believe that constant communication is the key to everyone's success. Entire Website © 2003 - Graphic Ink Systems, Inc. All Rights Reserved.